Healthcare is a burden that most Americans carry. It offers coverage for medical treatments and allows you to have the security you need in case of an emergency. But the cost of healthcare is rising. It is no longer affordable for many families to carry and takes a big chunk out of others household budget. There are ways that you can save money on healthcare, making it possible for you to keep more cash in your pocket while having the medical coverage you need. With these apps and websites, you can significantly cut your healthcare expenses while benefiting from the handy features they offer for health and wellness. 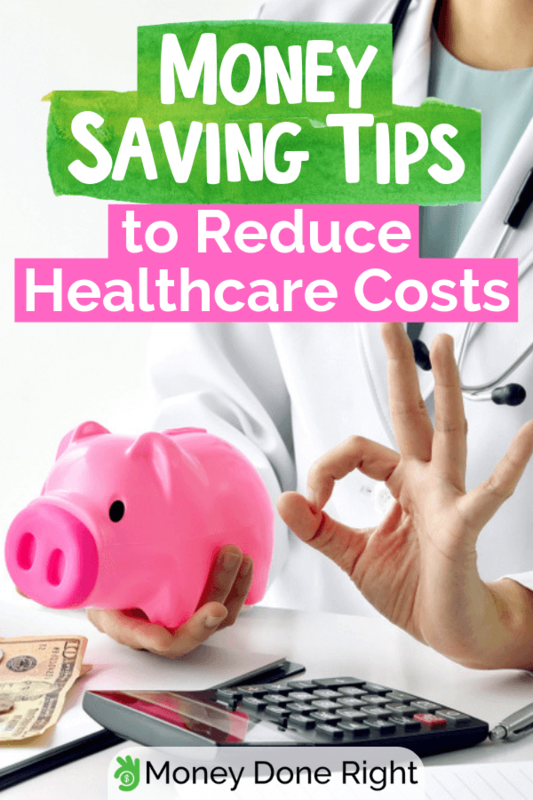 We know that today every penny counts, which is why we compiled an extensive list of 11 simple ways to save money and reduce your healthcare costs. If you are looking for more ways that you can put more money in your pocket, try these tips by clicking here. A big part of staying healthy is making sure that you are the optimum weight for your height. We all know that your health suffers when you have packed on a few extra pounds. With that added weight, it means more trips to the doctor’s office, more medical treatments, and medications, which can add up. By losing a few pounds here and there, you can get healthy and reduce the need to see your doctor so frequently. You may even be able to go off certain medications too. Reducing your time in the doctor’s office means fewer co-pays, prescriptions, and tests, which can help to reduce your overall healthcare costs. With HealthyWage, you can get the motivation you need to lose weight and reduce those healthcare expenses. HealthyWage offers you the ability to make a wager on your weight loss with others. You enter into a bet with a group of individuals that are also looking to lose weight. The person within your betting ring that reaches the goal weight first takes home the jackpot, which is a great way to keep interested in your weight loss program if you are the competitive type. If you lose the bet you made on your weight loss, you forfeit your wager and end up paying into the pot. Not only does HealthyWage keep you motivated but it can help you get healthy in a fun and engaging way. If you are looking for even more fun ways to earn money, try one of these ideas. Exercise is a big part of staying healthy, and by simply walking, you can get your heart rate up and help to trim and tone your body. While you may have every intention of incorporating fitness into your daily routine, you may not feel like the reward to do so is big enough. With Sweatcoin, you will see big dividends just by taking a walk. The app pays you to get off the couch and get moving. When you walk with the Sweatcoin app installed on your AppleWatch or smartphone, it will track your steps and pay you in cryptocurrency. You can collect coins, data mine or exchange them with the blockchain and watch as your daily balance grows. Sweatcoin offers the perfect opportunity to help you earn currency while saving on your healthcare costs. As you walk your way to health, you’ll have less of a need to use your healthcare coverage and will save on those dreaded medical bills. Sweatcoin is the top health and fitness app that has been downloaded on the Apple Watch more than any other app. You can rest assured that it is safe as there is no need to enter a credit card number or social security number. The app has been downloaded more than 28 million times and is a popular choice for users looking to get involved in cryptocurrency without any commitment or risk. When you are sick, you need the help of a doctor, but you may be concerned about how much it is going to cost you. Finding affordable medical treatment can be frustrating. There doesn’t seem to be answers, and the cost seems to be astronomical. You can save on health insurance with the Health Hopper app. This app will look for affordable medical treatment for you no matter where you are located. The app works by taking into account your medical budget, locating the most affordable option based on where you are located. It can offer you specialized treatment and medical care at a lower cost than you may be able to find through a healthcare insurance network provider. With Health Hopper, you can save money on healthcare as you are in control of your medical treatment. You do have choices when it comes to your medical care, and Health Hopper puts this power in your hands. If you are looking for more powerful ways to make money, check out these great tips. Understanding everything you can about healthcare and medical treatment can make you an informed patient. Not only will you know when you are being overcharged, but you will also know when the treatment you are receiving is not up to par. With The Leapfrog Group, you can inspire change to the current healthcare situation. The group is a watchdog advocate for healthcare insurance purchasers. It advocates on your behalf and collects the data you need to make informed decisions about your healthcare, which can save you money on health insurance costs. With The Leapfrog Group on your side, you will know what type of medical procedures are necessary and what is costing you more than is required. The Leapfrog Group has tons of information available on its website that can get you up to speed on the current affair of healthcare in the U.S. while providing you a quick education on your medical needs. This website is a great way to take control of your medical situation and make the decisions that are best for you and your health. Comparison shopping for healthcare just doesn’t seem possible. You don’t have the time or money to see multiple doctors or find out what each and every procedure you need costs. This puts most patients in a real predicament. They are saddled with medical expenses that they didn’t even realize would cost so much. With the Healthcare Bluebook, you can save money on healthcare as you are literally able to search by provider and see what your cost of treatment will actually be. This can help you choose which healthcare provider will give you the lowest rate much like you would shop for a car. You will be able to make smarter decisions about your medical treatment and ensure you are not paying more than you should for medical treatments. With Healthcare Bluebook, you can compare multiple medical facilities next to each other, so you know the advantages of selecting each one, which can make your decision easier. You are able to see the quality of care of each provider that you are looking to select from provides as well as how they stack up against their competition. This is an ideal site to really dig deep into your healthcare decisions. Choosing a doctor can be the hardest part of getting medical treatment these days. There are thousands to choose from, and you have little to no information on who they are. Unless you use Healthgrades. This website is designed to allow you to search for a doctor or specialist by the reviews that other patients like you have left for them. This can save you significantly on your healthcare as you are able to find the right doctor on the first try. You won’t have multiple appointments with doctors that you are unhappy with and pay costs that didn’t help fix your illness or condition. With Healthgrades, you can better understand who a doctor is and what their bedside manner will be if you book an appointment with them. This is an easier way to find healthcare without making a random choice that you may regret later. How many times have you visited a doctor only to have the bill arrive in the mail a few weeks later, giving you total sticker shock at the price of the visit? This has happened to all of us, and it doesn’t have to be this way. With New Choice Health, you can save money on healthcare by getting access to healthcare costs upfront. New Choice Health takes the guesswork out of healthcare costs. It provides a transparent view of medical treatments as you are able to see in advance what a doctor charges before you undergo treatment. With doctors charging all over the board, it can be easy to rack up medical costs that you can not afford. When you use New Choice Health, you can see firsthand what your medical treatments are going to cost, allowing you to be more in control of your healthcare choices. Plus, the website allows you to get a free quote on any medical services you are looking to receive. You can keep your healthcare costs to a minimum by using New Choice Health and put more money back in your pocket as you find affordable healthcare. Want to add even more savings to your income? Try these great ways to make more money by clicking here. Get the advice you need for your medical ailments with iTriage. This site uses a mobile Q&A format to provide users with information without barriers. As a nonprofit organization, iTriage can help you solve some of the medical mysteries that you often seek the help of a doctor for. While it is not to say that you don’t need a doctor to treat your illnesses, iTriage can help you with common medical issues that may not need full medical attention. Knowing what to do in some medical situations can help you avoid a trip to the doctor that can be costly. You’ll save more on your healthcare costs, and be able to treat those minor conditions just by asking iTriage a few questions. iTriage’s goal is to make information available to everyone and offers advice on virtually any topic that you can think of. You’ll be thankful that you have iTriage on your side as it is almost like having a doctor in your back pocket. If you are looking for a way to be healthier overall, you may want to check out the Good Guide site. This site allows you to search an array of products and see what Good Guide scientists have to say about them based on their composition. This can prevent you from using a product that is not safe or healthy for you. And with over 75,000 products in the Good Guide database, you can check virtually every item you use on a daily basis. Getting healthy includes making sure the products that you use on a daily basis are safe. By finding out exactly what’s in a product, you can determine if you want to continue using the product any longer with Good Guide. The site is constantly adding new products and gives a very detail analyzation of the ingredients with a product. You’ll see the toxicity level as well as other negative aspects of a product. Good Guide covers beauty products, household items, and baby and kid’s products. What to be safe with your money? Find out how you can make more of it by clicking here. Another way to get healthy is to eat right. While we all want to make good food choices, actually making that happen is another story. With Fooducate, you can make better choices when it comes to food. The app lets you count your food points and calories so you can maintain a healthy weight. Fooducate will also grade your food choices, helping you to make better decisions when you eat. And if you don’t eat right, it will let you know with a poor grade. With the app, you can also take advantage of dieting tips and be part of a community of members that will offer help and support. There is also a ton of healthy recipes that you can try to help you stay on track with your eating. You can save money on healthcare by making better food choices, and Fooducate will help you every step along the way. Managing your prescriptions can make your life easier and help you ensure you are saving the most with your healthcare costs. With the Walgreens app, you can easily reorder or transfer a prescription as well as see your complete medication history. When you need to reorder a refill of a medication, the Walgreens app allows you to instantly have it contact your doctor for a new prescription. This can save you a trip to the doctor and an office visit charge. You can also transfer a prescription from another location with a few simple clicks. The Walgreens app also allows you to rack up bonus points for every prescription you fill with the company’s rewards program. This can save you money on the products that you buy on a daily basis, giving you even more reason to save money on healthcare. As you look to pay your next healthcare premium, keep these tricks in mind for saving money. They can help reduce your total costs for healthcare and make sure you are not overspending for your medical treatment. What do you think of these ways of saving money on healthcare? Did we miss anything? Let us know. We want to hear from you. If you want to increase the money that you have available for healthcare, try these great ideas to make some extra money.